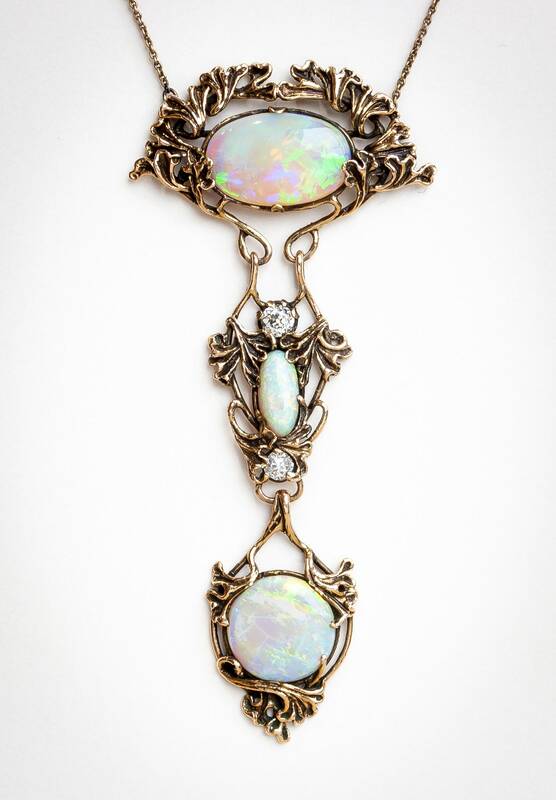 This fabulous suite of antique art nouveau jewelry was sold by Walton & Co. at the turn of the last century. It had been in the same family in Buffalo, NY for over 100 years and we were fortunate enough to recently purchase it from that family. The necklace and earrings exhibit exquisite craftsmanship and beautiful design technique. 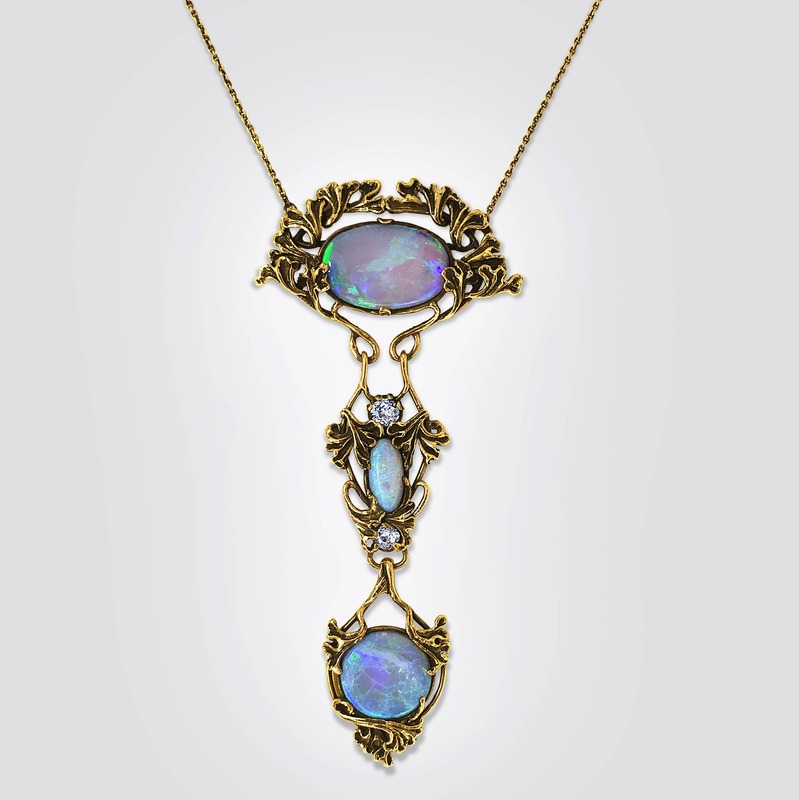 The necklace is composed of 3 movable sections, with the top section set with a gorgeous oval opal measuring approximately 20 x 12 millimeters and weighing approximately 8 carats. The center section is set with an oval opal measuring 11 x 6 millimeters and 2 old European cut diamonds weighing approximately 21/100 carat and 25/100 carat each. 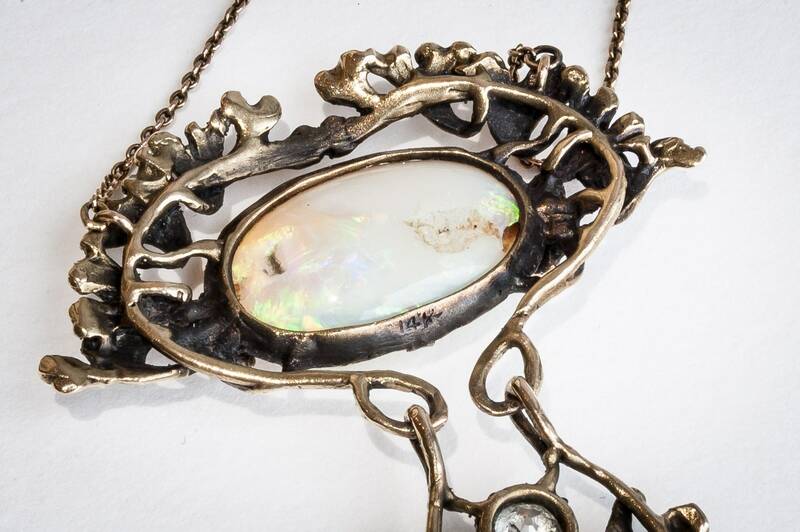 The bottom section of this spectacular necklace is set with a 14 millimeter round opal. 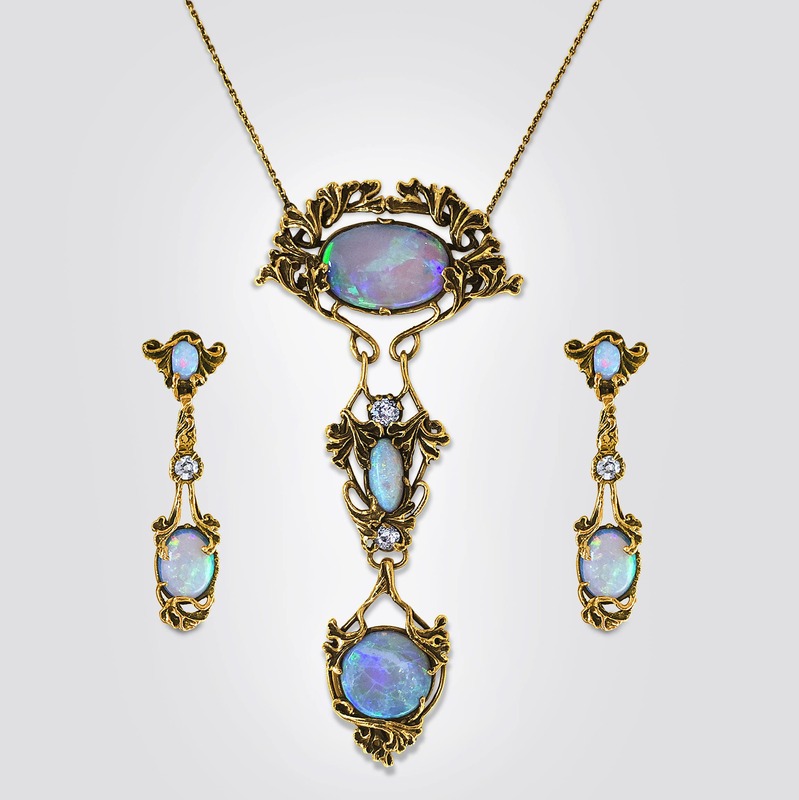 This is the only opal in the set which exhibits slight crazing; the other 6 opals are pristine. The necklace measures 16 1/2" long including the original spring ring catch; the pendant section measures 3 1/2 inches from top to bottom and 1 1/2 inches at its widest point; the earrings measure 1 5/8 inches from top to bottom and just under 1/2 inch at its widest point. Both the necklace and earrings are all original and show no repairs or replacements at all. Both the necklace and the earrings are signed very clearly on the back "Walton & Co." and stamped "14K". Walton & Co. was a fine jewelry store, comparable to Tiffany & Co., located in Los Angeles, CA in the early 1900's. 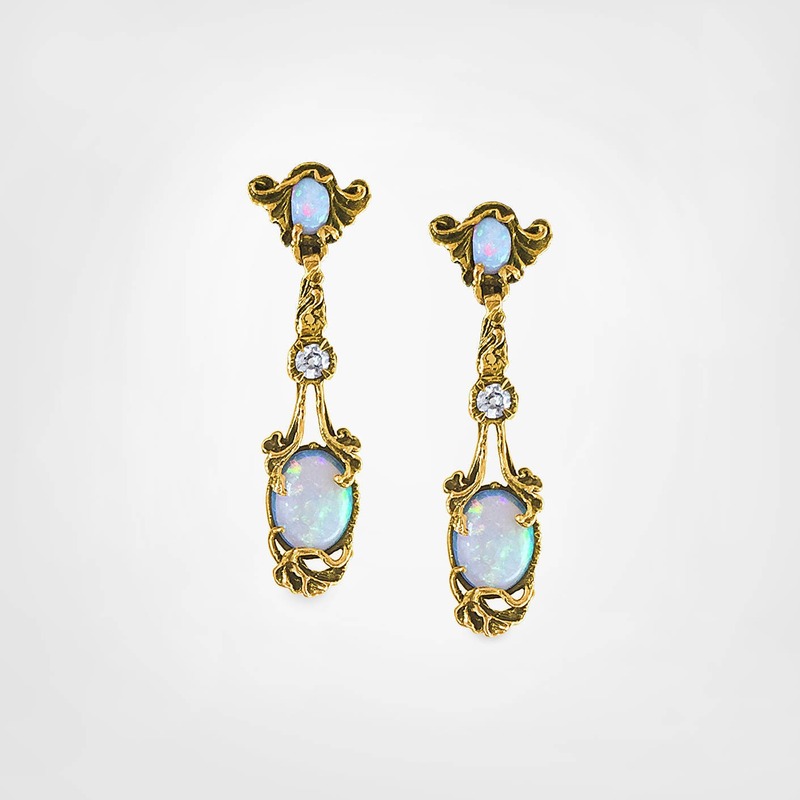 The matching pendant earrings are each set with two fine oval black opals. 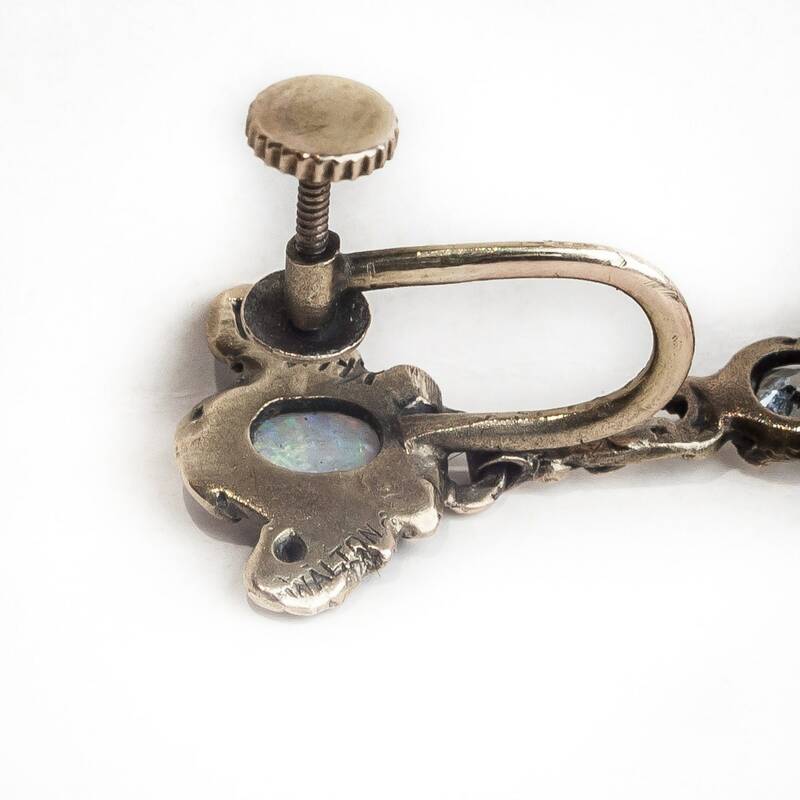 The top of the earring is set with a fine oval opal measuring 6 x 4 millimeters and the body of the piece is set with a fine black opal which measures 10 x 7 millimeters and weighs approximately 2.5 carats. The pendant section of the earring is also prong set with an old European cut diamond of top quality weighing approximately 15/100 carat. 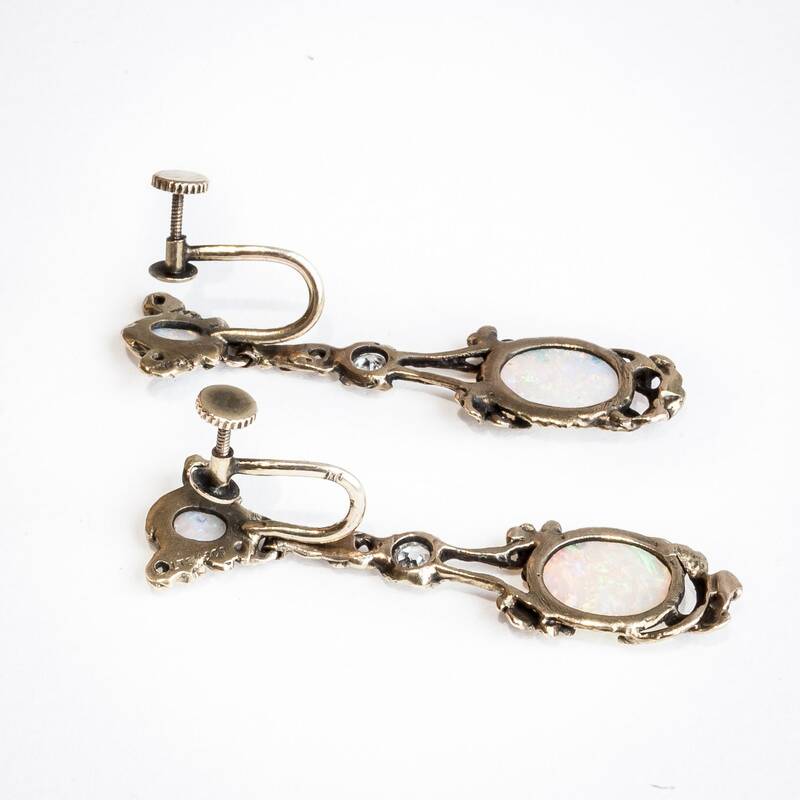 The earrings have the original screw backs for non-pierced ears which could be changed to posts if the new owner desires. 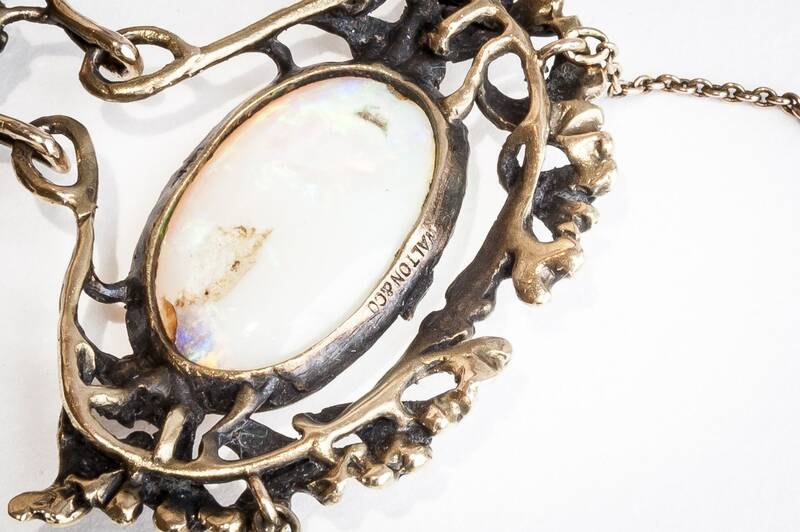 All of the black opals are in excellent shape and exhibit gorgeous play of color from greens, to blues, to golds and even some orange and honey tones.